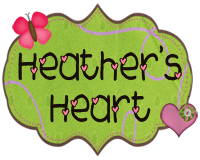 Heather's Heart: Is Your Heart in Your Room? I was at the city dump, landfill, tornado disaster site I mean my classroom today. I started thinking. Did you know that young children have not developed inner speech to govern their behavior yet? This means there is no little voice in their head that might be saying I should not hit my friend because I'll have to sit in time out or If I wipe my boogers on Ms. Price's rug, she will move my clip. This means they cannot think of the consequences for what they are about to do. Have you ever told your kiddos If you talk as we walk down the hall, you will owe me time on the playground. You then have the children repeat what will happen if they do. You take a few steps and someone starts talking. There was no voice inside this child's head governing their behavior and making a connection to what they do and what the consequences will be. Becky Bailey says that setting up a list of behaviors and the consequences that will happen if they don't behave that way often doesn't help because young children think in pictures. I'll talk more about this in another post. Becky Bailey talks about this on one of her Conscious Discipline cd's and I always have a WOW, light bulb moment when I hear it. I started thinking about all of the hours teachers put in getting their room ready. I know a lot of what we do makes us happy and creates a more positive and inviting learning environment. But I seriously doubt one of my Firsties is going to say, "Ms. Price, I love how you covered those drawers with that pretty paper." I am also pretty sure that cutesifying all of my clip boards will not cause my kiddos to be more engaged and able to learn better. We spend so much time in our classrooms....it really is our second home. But then I think about what I have at the top of my blog Before you reach their heads, you have to touch their hearts. I can come up with creative activities and be an awesome teacher but not make any effort to smile at my children or hug them or encourage and praise them. Will they learn? Probably. Will I reach all of my children? Probably not. Last year I looked up during a lesson to see a young man standing at my door. Right away I knew who he was. He was in my very first class....aka my guinea pigs that I should have stapled a note to apologizing for whatever I did...or better yet did not do to help them be ready for 2nd grade. He was finishing up his junior year and wanted to tell me about an assignment he had for his English class. He had to write about 2 teachers: his favorite and his worst. He said that he had to go all of the way back to 1st grade and me to think about his worst teacher. He said he knew he was a TOOT, a HUGE STINKER, and BAD to the BONE. He also said that no matter what he did he knew I loved him, forgave him and still expected the best from him. He probably could not have told me what the room looked like or even if he knew what his favorite lesson was. He remembered the way I loved him. As you get your room ready and mark the crafts off your to-do list, think about what you want to do to touch the hearts of your children. Also, remember that Because of You a difference can be made. Hop over to visit Erica at Sprinkles to Kindergarten. She is having a great giveaway and you have a chance to win some items from my TpT store and much more. She also has a fabulous blog and is as sweet as can be. I would love for you to take a few minutes to leave me a heart note. Each one is such an encouraging blessing to me. Love this! :) Good Reminder for someone who is about to set up a new room and spend a lot of time on making it cute. Thanks for bringing me back down to earth! Such a great reminder!! Thank you! That "Because of You" poem was beautiful and made me tear up:,) As I'm finishing up my classroom, thanks for the reminder that there are certain things that matter more than the "minor details" we tend to get so caught up in! Looking forward to more Becky Baily tips, as well! We were on the same wave length today. I was almost teary eyed as I wrote my post this morning. I so want my kids to know how much I love them! You are so honest and lovely with your words. They show your heart! Thank you for sharing your heart. HUGs to you! I LOVE your "In This Room" poem! I hope you don't mind me giving it to my kiddos at the start of this year! It's truly what I believe to be true. Thank you so much for sharing with us. You have an incredible way with words. I could only hope that someday, my little Coop will be blessed to have a teacher with such an amazing heart. This reminds me so much of the quote, "they may forget what you said, but they will never forget how you made them feel." (Carl Buechner) So glad you shared this! I really needed to read your story about your former "Bad to the Bone" student coming back to see you years later. I've been "warned" about a "bad boy" I'll have this fall, and I've been stressing about how I can work with him, not have him disrupt the whole class, etc. Thanks for your words of wisdom! I loved this post, Heather. Thank you. I have been in a funk this week. As a new blogger, it is too easy to become intimidated by all of the wonderful posts about cute classrooms, new products, and giveaways. Your post helped me to refocus on what really matters! I love this! I have always said that I will be a great teacher in the inner city (soon to be the Bronx) because kids (all kids, but particularly kids in unstable home environments) need to feel safe and loved at school. This sign will definitely be going up for them. 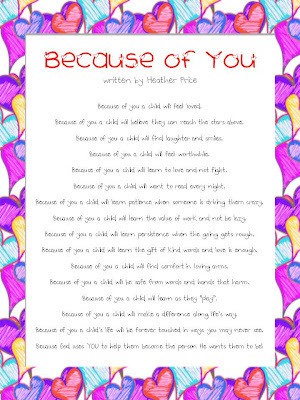 Your "because of you" poem reminds me of a little thing my cooperating teacher and I did during my student teaching. When we had a particularly hard day (or week), we'd forgo planning during lunch or a special and we would sit and recap the cute and funny things that were done that day or the week. It reminded us why we became teachers. I want to print out your poem to do just that. When I am having a bad day, I will read it and it will always remind me why I became a teacher and why I love my job! I also love this post!! Thank you for providing some perspective at a time when we can get overwhelmed with the little things in our classrooms! Thank you so much for the inspiration! I love your poems and really am learning from your blog. Heather - really loved your post today. That boy coming back to let you know what an impact you had on him makes all the time and heart we put into this worth it. 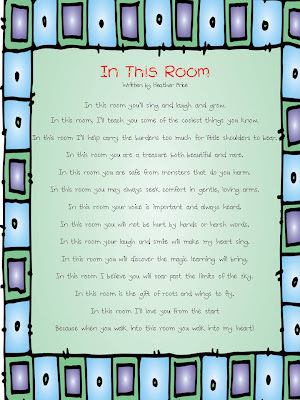 I love the poem "In This Room"! I made it over to check out your cute poems! I totally agree about reaching and touching each child's heart! I always make sure I am at my door when the first child comes in and until the last child leaves to give them each a big hug! AND what a sweet story about your former student. That must have made you feel so wonderful! Also, I would definitely be up for a Houston bloggers get-together! Sounds fun!! Heather your words are so eloquent! Dr.Becky Bailey is amazing. I was fortunate enough to have been able to attend one of her week long institutes several years ago and she is absolutely amazing. Thank for these beaautiful words of inspiration. Your blog reminds me of the reason I am a teacher. I am trying to learn all this technology stuff so hopefully this comment will actually appear. Great reminder! I think it's easy to get caught up in the superficial things in life, and teaching is no different! Especially with all the cutest room competition out there in the blogging/pinterest world! Great reminder Heather! It's not about the decorations (which we all probably spend too much money/time on lol!) it's about the heart! I do try to make my room feel comfortable and be attractive, but I'm not going to beat myself up if it isn't as cute as someone else's etc. Loving those kiddos is what is important! Today at my positive discipline class we got a little star fish glued to a card to remind us that we can make a difference for each individual child - and that has nothing to do with how cute our room is! Two. If you remember nothing else remember you are important and loved. My third goal is that you are smart and can do many things. I want each child to leave feeling valued, loved and able. I feel love is the answer, and prayer butidothat on my own. I just wish we could have lunch so bad and you could share all of your wisdom with me about conscious discipline. . I'm so glad one of your old students came back to see you. Love covers a multitude of sins. Those are the sweetest poems ever. What talent. I love them. Thanks for sharing. Thank you, Heather! As I hop from blog to blog I get a little overwhelmed at the lack of cuteness in my room. There will be plenty of it there come September, but right now I'm praying for each of my students daily. I'm blessed to already know them by name! I hope I can reach each of their hearts. Thank you for such a beautiful poem! Wonderful reminder, thanks for sharing! You made me laugh and cry in the same blog. Well done and I could not agree with you more. Thank you for sharing and I can't wait to see what you do with the poems (so I can copy you)lol. Very inspiring. What a great reminder as we all begin to start getting ready for next year! In this world of crafty blogs and Pinterest its easy to get caught-up in the little things -things that wont matter when all is said and done. Love it! I've just nominated you for the Versatile Blogger Award. 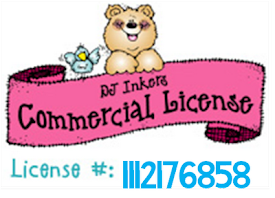 If you want to claim it, visit my site. Heather this post has made my day! I feel so similar and I love making crafts and things for my classroom. However, I just finished teaching summer reading camp and I don't have a lot of time to devote to crafting. Thanks for easing my stress and helping me focus back on the reason why I do, what I do! Love this! BTW the In This Room poem is precious. You're the person who turned me on to Conscious Discipline ... thank you! I gave you a little shout-out today. Have a super day and weekend! Love your message and your blog! I nominated you for an award, stop by my blog to receive it! I am an email follower of your blog. EVERY time I read one of your posts, it touches my heart so deeply. Your poems are especially powerful! I discovered CD several years ago, but I am so glad you provide helpful reminders and ideas for making it work in "real life"! Thank you for the daily encouragement and reminders about loving "our kids" being the number 1 thing on every list! Keep up the good work! I hope we can meet someday. That's a great story...I'm always amazed when they grow up and come back to visit. I feel so humbled knowing that I made a different to this young person's life. I nominated you for an award! Swing by my blog to pick it up! Thanks for helping keep everything in perspective!! True wisdom!! Happy Weekend! Okay, so when I saw that you posted I was like "OMG! is that Heather from Heather's First Grade heart?!" I kind of love your blog, and have been here ALOT. Thank you so much for stopping by!!! Also, I saw your monster freebies...OBSESSED! I just bought those last week, and made a compare to 120 game. I can't wait to make more with them!!! What a neat experience to have a student come back that many years later! I'm really hoping that will happen some day to me and hopefully because I was their favorite teacher & not the worst. I can't wait to read through your blog! 2nd grade after 27 years of being with 3rd/4th grades. I knew NOTHING about younger kids. It was a very challenging year. I hope this year will be much better. I will remember what you said in your post. Thanks. Thanks for sharing Heather--puts everything in perspective. I love what you said because it is very true. No matter how amazing the lessons what our students remember is the feeling we left inside of them after each lesson and at the end of each day. Sometimes it is hard to remember that with all the things we have to focus on. Thank you for bringing it to the forefront. And since I think you are awesome I have given you an award! Stop by my blog to claim it. Beautiful message, Heather! :) Thank you! What an inspiring post! Thank you for sharing. You are a talented writer! I hope one day to see a former student of mine return. What an inspiring post! Thanks for stopping by my blog. I'm your newest follower! What a great post! Thanks for following my blog..I am now your newest follower! LOVE your blog already--can't wait to look through all of your great ideas! Oh Heather... you ARE the best! So inspirational. I look forward to reading your posts every week! :) Love your encouragement! Hey... can you tell me how you type with the words "crossed out?" So funny! I'd love to know that tip! This brought tears to my eyes! Definitely makes me remember why this is my life! I love this and can't wait to share with others. Heather, I think if you and I knew each other in " real life" we would be friends. :) Love btoh your notes and they are a good reminder of WHY we do this crazy thing called teach. I hope you are going to put these on Teachers Pay Teachers because I would love to use both of them. I have a little teacher prayer I found on Pinterest that I try to say every morning before my kiddo's come in. But I would love to have that one as well. Such a great reminder about what is important in the lives of teaching. I had a student contact me last year and tell me if it wasn't for me who would never have survived or gotten where he is today instead of the "punk" he knew he was when he walked in my door in 3rd grade. That was a light bulb moment for me too. Thanks for popping by my blog. I am now your newest follower. First of all, how cute is your *squirrel* moment? I absolutely love that! Second of all, good grief, Charlie Brown! From this post, I can tell our outlook is SO similar. The poem was so cute I nearly cried. It's exactly what I need in my room. Your header quote... ugh, so precious, so true. I'm in love! Just from this post, I can see what a wonderful teacher you must be - as clearly evidenced by the former student returning. Which just so happens to be the type of thing I dream about with the group of kids I teach. Thank you so much for checking out my blog - because I absolutely adore yours! Thanks for the sweet reminder and hopefully I have the patience to use as much heart as you do! Thanks for becoming my most recent follower...I will follow suit. Apple on! What a great reflective post. Loved it! Makes us stop and remember the important things. Thanks for stopping by and leaving a note on my blog! What a great reminder! You are so right: students will likely never remember how organized or "cute" the classroom was. They are much more likely to remember how we, as teachers, made them feel. Thank you so much for popping over to my new Blog Teise's Tidbits! You are my very first follower! :) I made that adjustment you suggested...hoping it worked. I love your blog...I want to be like you! Hopefully with time I will. Thank you so much for your kind words. Have a great Sunday. Thanks for stopping by my blog Heather! I love your blog and now I am following you! Heather thank you for stopping by my blog! I will be following your posts from now on. Super blog! Heather I love your post. Making that extra effort to show those little ones that we truly do care about them is a surefire way to help them enjoy school and life. Thanks for stopping by my blog. I'll be sure to visit yours quite frequently. Heather, I love your post:) Your blog is awesome too. This is my first visit to your blog and now I am one of your followers. Thank you so much for your insight. It's important to remember why we have blogs...the children! We can get so caught up in trying to cutsify every little thing and when you stop and think, do six year old really care about the color of the book bin labels? No, they just want to know where to get a book! You are such a blessing to everyone who had the chance to read this post and really reflect on the importance of teaching! Your posts always bring great joy to my heart and help me to keep things in perspective. Such a great message! Totally agree with thinking if cutesifying everything is necessary and the way to touch a student (ew, not in that way) is through their hearts. I definitely pick my battles on what is worth the extra craft effort and what is not. Thank you for stopping by my blog... I love your poems, they are so heartfelt! The way you talk about your students it is apparent that you have a BIG heart and probably wear it on your sleeve. Thank you for a breathe of fresh air. I am your newest follower. Thanks also for offering to contribute to a giveaway. I would definitely like to take you up on that. Keep you posted! Thank you for following my blog:) I am your newest follower. I enjoyed reading your great poems! What a great reminder! Thanks for this encouragement right before we go back to school...just what I needed! Glad we found each other! Your blog is adorable! I will be emailing you for advice I am sure! Heather, I am a follower now! Love your blog! I will be visiting often! Awesome post! And so true!! Thanks for this great reminder as we start to get in "back to school" gear! I do feel like we are sharing our heart with our students as we prepare our classroom for our new class. I have always thought of it as preparing a nursery for a new baby. It has to be functional, warm, fun, and inviting. However, the teacher is the one who ultimately makes each student feel loved and treasured!!! How blessed we are and privileged to share God's love through our actions with our little ones each day! Thanks for becoming my first follower, Heather. I just checked out your cute site and can't wait to see more. 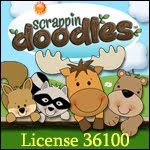 I love all your fun downloads and am excited to download some of them....especially Pete Rocks. I love Pete!!! I couldn't agree more! I LOVE your blog! Thanks! Heather, thanks so much for this post! I'm a speech therapist and have a small room. Before, my desk was the focus point upon entry, and I have moved the desk so the student table is the first piece of big furniture. I felt really limited in my space, and your post made me think of students, not the physical space, and it's working out so much better! I just gave you the Versatile Blogger Award!!! Hop on over to my page to check it out! This is so sweet! I love how you posted that your room is a HUGE mess. Mine is awful right now. Thanks for stopping by our new blog! WOW! I am so glad you found me so that I could find you! I can already tell that I am going to love your blog as much as I am sure your first graders love you. As a former first grade teacher I miss the little ones but I think that perhaps my third graders need my love even more. Sometimes I think that teachers of older students don't love on their kids as much as much as teachers of younger students because they think that the older students don't need it. Unfortunately they couldn't be more wrong. Thanks so much for sharing such wonderful reminders with us out here in blogland! Thanks for the great reminder! I get caught up in the craftiness of it but you're right...the kids hearts are more important! THANK YOU SO MUCH FOR FOLLOWING ME!!! I've been stuck at 69 followers for like, a year! And just today I've had 3 new followers...it has made my day! I can't wait to look over your blog...it' looks so fun! Thanks again Heather! I truly love your blog and the whole concept of touching the student's hearts before you can teach them. Oh my goodness!! You could not have made my day any more than with this blog post. I just opened my email and noticed the comment you sent me so I checked your blog out. I usually don't read long posts. I'm more of a picture girl! ha! I am soooo glad I read it. Thank you for a great start to this school year! I am sure somewhere in your history of blogging you have already been nominated for this award. But when I heard I was to nominate others for the versatile award I couldn't help but think of you right away. Stop on over and receive your award. WOW! Heather's Heart just touched mine! It's funny, I always tell my students that I will ove them unconditionally, I will treat them just like I do my own, and that before I can teach them one single thing, I have to be sure they are happy, safe, and comfortable. With that said, here I am, planning just how I want my room to look, making cutesy boxes and wreaths, and "stuff", when, as you've reminded us all, we need to be "stuffing" our hearts with love, patience, and encouragement for our new babies. Love your post! I'm about to head into my classroom right now to work on cutesifying my things! So true Heather, we can spend all kinds of time beautifying the room, but if we aren't connecting with our kids heart to heart, then what is the point? I love your blog, it always points me back in the right direction especially when I get sidetracked. I'm so happy that an ex-student came back to see you and had never forgotten that you loved him. Let's face it, in some cases, a great teacher is sometimes the best part of a little's ones life. Hi Heather! I've been a fan of your blog for a while and I am now your newest follower. Thanks for taking the time to check out my newbie blog. I love what you wrote. It's always in the back of my head when I get discouraged that my room isn't as cutesified as someone elses, but I always strive to make lasting relationships with my students and try to really "get" them. Heather, Thanks for stopping by my blog and visiting! Your kind words meant so much to me! HOw neat is it that we both have used the same free blog template?! I have been following your blog for several months now. Your posts on Conscious Discipline inspired me to borrow the book from my guidance counselor. I haven't read it yet :( because of the cruise and graduate classes this summer, but it is on my list of things to do very soon! Your thoughts always hit home with me and remind of how important our jobs are as teachers. Building character and planting the seed for good behavior is just as important as teaching academics. I look forward to your future thoughts and ideas on CD. I have become and "official" follower of your blog now. I always thought that if I followed a blog by email I was truly a "follower." Now that I have my own blog, I have come to realize what a real follower is! Thanks for joining my blog. I am now following yours! It's such a cute blog. I love it! This is a great reminder. I'm spending lots of time making my classroom cute and home-y but the real home-yness (love making up words) will come from me and how I behave toward my little family of second graders! I'd like to pass along an award to you. Hop on over to my blog to claim it! Hi! I am a new follower through the hop and I have nominated you for the One Lovely Blog award! Come to my blog and check it out! Thanks for being a follower! I have returned the favor! Love your blog! I love your blog. When you get a chance stop over at my blog, I have given you the "One Lovely Blog" Award. I love that post! It is great to create fun decorations for your classroom, but your right, the children will remember how you treat them more than they will remember what the room looked like. Thanks for stopping by my blog Heather! I've loved looking through yours. I like the poems - can't wait to see what you're doing with them. What a wonderful though, and such beautiful wording! Thank you for a wonderful reminder! I love the two poems. I will be hanging these in my room and reading them often. I absolutely love your "In this room" poster. I'm going to post it on my door. I can't think of better words to welcome my students. Heather, I love your observations about the decoration we put into our space. So many of us have themes that we use to tie our rooms together. It might seem like a lot of wasted time to some, but sometimes even the display around the work catches a kid's eye and attention. Thanks, as always, for the great insights. Thanks for the reminder. I need to remember this. Maybe I'll be able to stop stressing so much about my room. I've been trying to prioritize since I'll only have about a day and a half in my room before school starts. The district officials just don't understand how much it means to us to have time in our rooms before school. Thank you again. WoW! After reading all your comments I can tell I'm not the only one who thought this was a fabulous post. This was exactly what I needed to hear right at this moment. me at my new blog! some time now under another ID! I love your post and obviously so do many others! about all that has to be done and not having adequate time to move classrooms, set up a new room and make everything just so. It's nice to be reminded that the kids just want to know they are loved and encouraged!I can easily do that! The rest will come in time! Sigh. I love these! Thank you for sharing them. I will be printing and posting in my room. 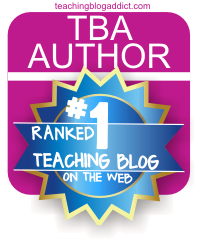 Thanks for stopping by my Sped Prek blog! I LOVE your blog, its adorable and your ideas are so cute! Thanks for sharing!